Tons of technology equipment waste continues to fill up our landfills and pollute our environment every day. The MY Green IT Day movement targets technology resellers and their end-users to do something simple to reduce the impact of IT waste on the environment. Start your own “My Green IT Day”. 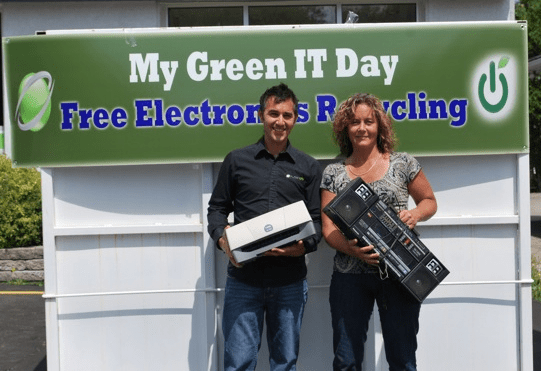 We are encouraging every IT reseller (including all IT products, consumer electronics and cell phones) to host their very own My GREEN IT DAY once per month (or at least once per year), whereby they invite all of their customers and local community to drop off their not-working, broken, used, obsolete equipment to their location. The reseller will simply package everything and ship it to the nearest authorized recycle depot. They can generate some good PR within their community. They can get their vendors to participate by sponsoring or offering rebates for competitive equipment traded in. The reseller could even generate some sales. It is an opportunity where everyone wins! Find out more at www.mygreenitday.com.